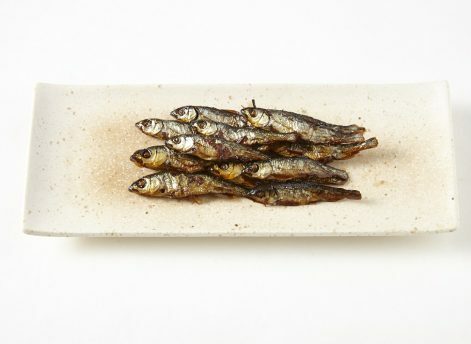 A local traditional cuisine, in which pale chub (Oikawa in Japanese) - small fish that swim in the crystal-clear water of the Nagara River basin - are cooked in soy sauce, sugar, mirin and ginger and made into kanroni. The name "Ikadabae" is said to derive from how the people described the schools of pale chub that often gathered under the timbers tied together in rafts at the mooring point for timber transportation around the mid-stream of Nagara River during winter. One of the few stores which offer "Ikadabae", a local specialty tsukudani made by cooking the rare, seldom-caught pale chub in a thick soy sauce. This store cooks it the old-fashioned way: without using chemical seasonings or frozen fish, in order to maintain the taste and freshness. The ginger used to give the dish a kick brings out the taste and flavor, making the dish very satisfying to the taste buds. ＜Messages from the Staff＞ We cook pale chub (Oikawa) caught in the cold season in winter using the old-fashioned method, from scratch and with no additives. A long-established tsukudani shop that has continued since the end of the Edo period. This place is loved by not only the local customers but also customers from far and wide. Kanroni of sweetfish and amago, land-locked red-spotted masu trout, - simmered down in sweetened, thick soy sauce - is also sold as well as other items. The store is passionate about making it additive free and from scratch, and cook it with all their heart, full of love. It would make a nice gift for your loved ones.